Providing a long history of world class quality, these forged hooks are made to the German-origin, European DIN 15400 series of standards. These exacting standards define all aspects of the forged hook including design, material requirments, and final quality requirements. 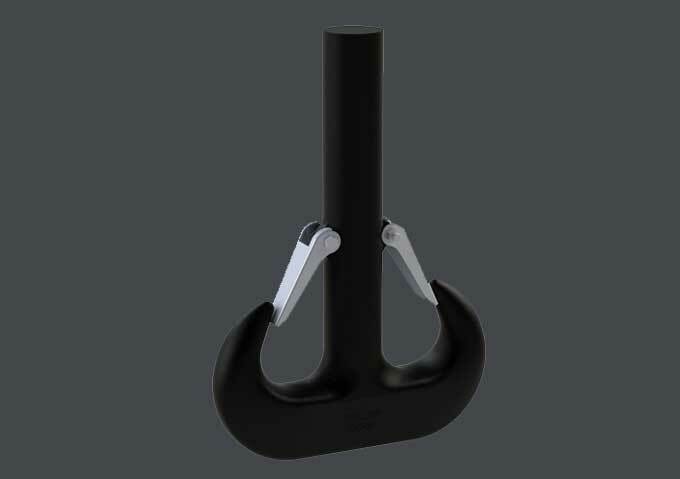 Each hook is provided with a manufacturer's certificate by serial number, documenting chemical and physical properties and completion of 100% ultrasonic and magnetic particle evaluation. Hook are available in carbon steel, two alloy steel grades, stainless steel, and bronze-clad. All hooks are shipped with safety latches installed. Miller offers in-house machining services to provide the finished hook shank and its matching nut as required for the application. Extended shank lengths and custom forgings are available. See Specs pp. 5-6 for Duplex Hooks per DIN 15402.